Crazy times! I did complete a project this past week, plus bind a huge quilt, have a grand opening of my quilt studio and I'm sure I did more but I can't remember. First for the project. It's another bag. 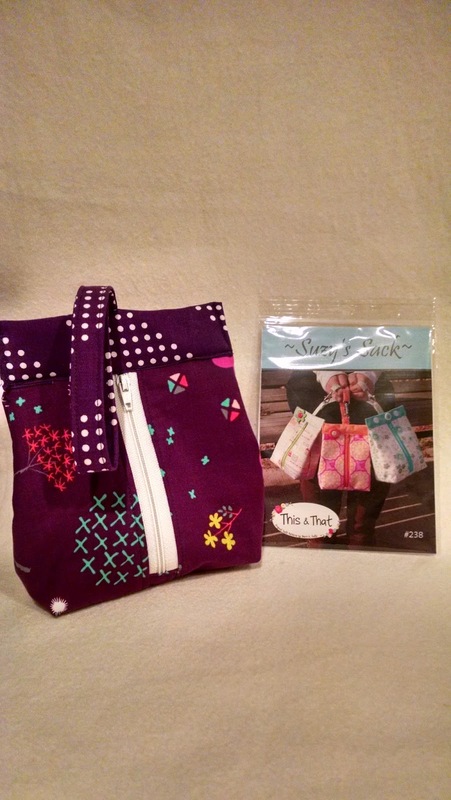 "Suzy's Sack" by Sherri Falls of www.thisandthatpatterns.com. I think it turned out well but the instructions seemed a little vague. I love good directions. I don't want to have to think too hard and work harder. JUST MAKE IT SIMPLE. That's my motto. The finished size is 4.5 x 6.5 and I used some of my Cotton and Steel fabric that I am loving. As for my grand opening, it was grand. They were plenty of attendees, good food, demonstrations, good wine and a good time had by all. I'm going to video tape a virtual tour just as soon as I can, so everyone who was not able to attend, can check it out. If you would like to see pictures, at the present time, go to my facebook business page at Sprague Quilts and follow me on Instagram at Loisspraguequilts. I just finished a top with a lot of beadwork on it and will be posting something about that later. Right now, the top is going on the Gammill because I have less than 2 months to finish it and try to get it juried into an exhibit that will open in Houston in October, so until next week, keep on quilting! So for this week, it's another bag pattern. This one is by Atkinson Designs. It is called "Bridget's Bagettes." I love Terry Atkinson's patterns for quilts, my fav is Yellow Brick Road and I use it anytime I need a quick, awesome baby quilt, which seems to be frequently. The author is the main reason that I bought this pattern. I liked the clear vinyl front of the pouches and the overall design looks good but I found this pattern to be a little difficult. I found several portions of the instructions to be a little vague and I had to rip out stitches, which I hate to do, not once, but 3 times. I would give it a 3.5 difficulty on a 1-5 scale. Not for the beginner. That being said, I made two and the second one came out better, so I would make it again. So till next week, and probably yet another bag pattern, keep on quilting. My Grand Opening for my new studio is on March 14 from 5pm till 9pm. If you are in the Oceanside, CA area the address is 1660 Ord Way. Come out and enjoy the festivities. Hope to see you there. Right on track with the project of the week and I'm not even sure how that happened. This past week I decided to work on bags. I really love a good bag pattern. 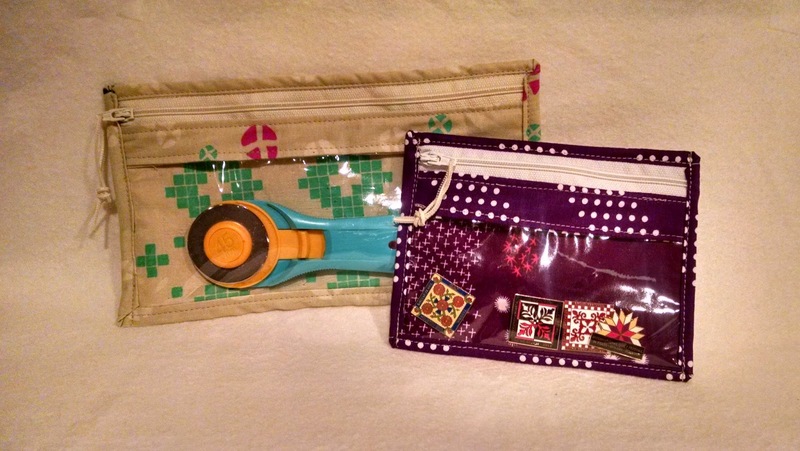 "Click-it Bag" from Robin Gallagher of Robin Quilts Inc, certainly met the criteria. This bag was fun, easy and attractive. I ended up making three, just because that's what I do. 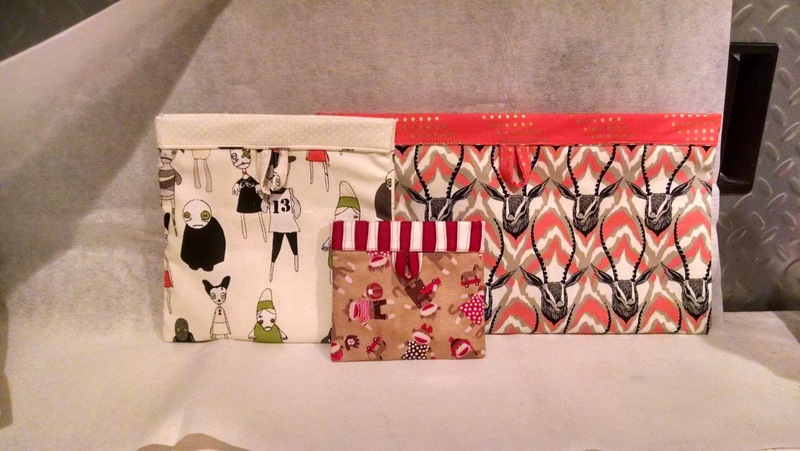 I used some Riley Blake fabric, sock monkey fabric and some of the new Cotton+Steel. They turned out FAB! So: short and sweet. Got a studio to get ready to open to the public in approximately two weeks so life is a tad bit busy. See you next week and keep on quilting.